Storm Buries Kansas, Missouri As It Heads East : The Two-Way Winter Storm Q has dumped up to 17 inches in parts of Kansas but brings much-needed relief to the region's drought-stricken farmers. 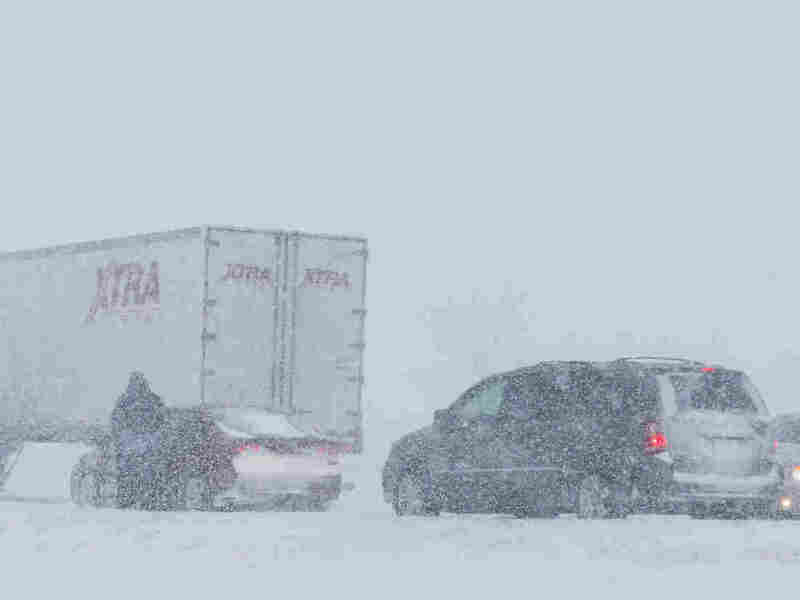 Scene along I-35 near Kansas City on Thursday. The biggest winter storm this season is causing delays and cancellations, and has brought traffic to a near-standstill in the Plains and Midwest, but it's providing much-needed relief for drought-stricken farmers. According to Weather Underground Chief Meteorologist Jeff Masters, Wichita has its fifth biggest snowfall on record. Winter Storm Q has dumped up to 17 inches of windswept snow in parts of Kansas and Missouri and is expected to extend its reach well into the Midwest on Friday. Sharon Watson, a spokeswoman for the Kansas Division of Emergency Management, says major highways have been reopened, but police are still checking for any drivers who might be in trouble. Teams from the Kansas National Guard are also patrolling state highways. Frank Morris of member station KCUR reports from Kansas City, Mo., that the storm has "triggered dozens and dozens of accidents in Iowa, Nebraska, Oklahoma and Missouri, and shut down a 200-mile stretch of I-70." In parts of Kansas City, stuck cars, trucks and buses rendered the streets impassible even to snowplows, Morris says. Seth Jones, driving an orange dump truck with a huge blade out from, had to step down to push cars by hand because he couldn't get through. "The bus is in the way and cars [are] in the way," he told Morris. Jimmy Jackson had been trying for two hours to get into work, only to find it closed once he finally made it. "So, I'm on my way back to the house now," he said. But the Weather Underground's Masters says the storm will "put a noticeable dent in the Great Drought of 2012-2013 over the Midwest." A second storm due to move through the region on Monday will provide a bit of additional help. The twin storms promise to drop more than an inch of rain (or liquid equivalent rain, for regions like Kansas and Nebraska getting heavy snow). Many areas of the drought region should enjoy their wettest day in months on Thursday. "I think the value of the precipitation [the storm] is dumping is probably in the billions of dollars," Masters tells NPR.